You could use something gentle, like the lovely Amaro Montenegro, or something in-your-face, like the aforementioned Fernet. You could go insane, like a few intrepid Chicago bartenders have done, and actually make cocktails with Jeppson Malört, which is the most mind-bogglingly, unrelentingly bitter liqueur ever. Or you could find something relatively rare, like a pelinkovac from Serbia or Croatia. Just remember we’re talking about a bitter liqueur you drink from a glass, not an aromatic bitters you add by the dash. […] The world of bitters is your canvas. That I have come to like bitter liqueurs is one of the biggest surprises for me in my growth as a cocktail geek. I’ve had great success mixing with Campari and Ramazzotti, and truly love Aperol. For this MxMo, I thought I’d talk about another favorite amaro, Averna. Made in Sicily, Amaro Averna is named for the family that has produced it since 1868, originally for house guests. The original recipe was reportedly created by Benedictine friars who gave the recipe to Salvatore Averna in 1859 as a thank you for his role as benefactor of the convent of the Abbey of Santo Spirito in his hometown of Caltanissetta. It was Salvatore’s son, Francesco, who started taking the amaro to fairs and creating a wider audience. Averna is produced by soaking a secret blend of herbs, roots, and citrus rinds in a base liquor, after which a natural caramel is added for sweetness. It is bottled at 64 proof (32% ABV). On the nose and the tongue, the caramel is definitely evident. There’s a slight citrus tang. The herbal profile is well balanced, so much so that I’m not absolutely sure what is there. I sense a hint of gentian and some cinnamon notes. It’s the sort of flavor profile that makes me want to train my palate better to pick out the specific constituents. 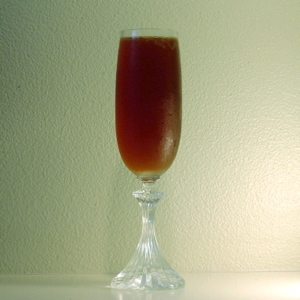 Over at A Dash of Bitters, Michael Dietsch demonstrates that Averna works well with Campari. This confirms my finding that sometimes the best way to mix with a flavorful spirit is to mix it with another flavorful spirit. I wanted to have a drink that featured Averna more prominently. My favorite way to drink it is on the rocks, topped with sparkling lemonade. I also enjoy Aperol in a spritz with sparkling wine. So I decided to create a riff on the French 75, only using Averna instead of the simple syrup. Shake first three ingredients and double strain into a champagne flute. Top with sparkling wine. I resisted the urge to add some additional sweetener to this drink. Averna is fairly sweet for an amaro, and I think it brings enough to make this a well balanced sipper of a drink. Thanks to Chuck for a great topic. Be sure to keep an eye out for the MxMo wrap up, which is sure to be full of other celebrations of the bitter side of liquor! Thanks for the lesson on Averna. I too have found that the bitter liquors are becoming more and more intriguing. Perhaps because most of them have such an interesting history and they are so much more complex than a lot of the newer products on the market. Looka!» Blog Archive » Mixology Monday XXXIX: Amaro — The Roundup!